Essilor of America announces that Millicent “Millie” Knight, OD, FAAO, FAARM, will be joining the company as Senior Vice President, Customer Development Group and member of the leadership team, reporting to Rick Gadd, incoming President, Essilor of America. In this role, Dr. Knight will be responsible for Essilor of America’s professional relations, communications and eye care professional and sales training efforts. Prior to Essilor, Dr. Knight was Vice President of Professional Affairs, North America at Johnson & Johnson Vision Care, Inc. 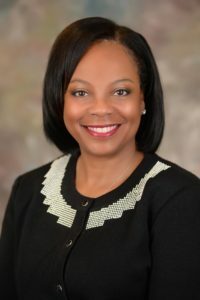 While there, she served on the North American Leadership Team where she developed and deployed a competitively differentiated eye care professional strategy, establishing connections between the company’s strategy and eye care professionals and industry leaders by building industry affiliations, education platforms and advocacy. Dr. Knight has consulted for eye care and health and wellness companies, conducted contact lens and solutions office clinical trials, and lectured on a wide variety of topics including contact lenses, leadership, cultural sensitivity, eye and systemic health, and business and entrepreneurship. She has published numerous articles, and has received wide-ranging industry and academic recognition including “Optometrist of the Year” by both the National and Illinois Optometric Associations, Vision Monday’s Most Influential Women in Optical, and a Women in Optometry Theia Award for Leadership. Dr. Knight received her Doctor of Optometry degree and a Bachelor of Science, Visual Science degree from the Illinois College of Optometry. She also holds a Bachelor of Arts degree in Biology from Augustana College. She served on the board of trustees of both alma maters and has received leadership awards from both institutions. The Essilor Optometry Student Bowl™ (OSB) is always a popular part of Optometry’s Meeting, and this year was no exception. Essilor of America, the nation’s leading manufacturer of optical lenses, once again pulled out all the stops to celebrate the 27th annual OSB held at Optometry’s Meeting in Denver, CO. More than 700 attendees gathered to watch the contestants — students from all schools and colleges of optometry, answer optometry-related questions while their fellow classmates energetically cheered them on wearing war paint, school colors and displaying brightly colored banners. This year, the OSB also welcomed the Chicago College of Optometry as a first-time participant. 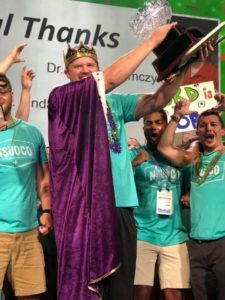 In addition to bragging rights, the winning school, Northeastern State University College of Optometry, took home $1,000 and will house the coveted crystal trophy until next year’s meeting in St. Louis, MO. The winning question below, was answered by David Hurd, class of 2019. Second-place winner, Steve McArty, from the Illinois College of Optometry, received $750 and third-place winner, Jimmy Nguyen from the New England College of Optometry received $500. As in previous years, each OSB contestant was presented with a Volk® Pan Retinal® 2.2 blue ringed lens, generously donated by Volk Optical President Dr. Jyoti Gupta. In addition, the first place winner was presented with a suite of 6 Volk diagnostic lenses. The Spirit Award went to Southern California College of Optometry, who will create next year’s “rules video” that is played at the beginning of the event. The social media-based Virtual Spirit Award was given to four schools: Kentucky College of Optometry, Northeastern State University at Oklahoma, Southern California College of Optometry and University of Houston College of Optometry. AOSA T-shirt design competition winner was Southern California College of Optometry. Lead Judge – Dr. Linda Casser, professor, Pennsylvania College of Optometry at Salus University; author, educator, clinician, and 1997 American Optometric Association (AOA) Optometrist of the Year. Dr. Jeffery Walline, representing the American Academy of Optometry, is Associate Dean of Research at the Ohio State University and was a two time OSB student contestant in the 90’s. For more information and to see some of the excitement from this year’s Essilor Optometry Student Bowl, visit www.facebook.com/essilorPro. 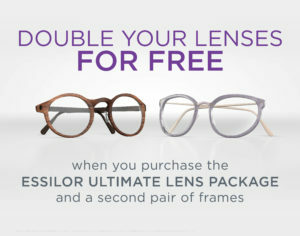 Due to popular demand, Essilor of America is bringing back the Ultimate Offer, a consumer promotion supporting the “Essilor Ultimate Lens Package” that has increased practice revenue and profit, by driving new patients into the practice and increasing premium lens sales like no other promotion Essilor has offered. Available only to independent eyecare professionals, this offer is available from until December 31, 2018 and will be supported by national television and digital consumer advertising. “By participating in the Ultimate Offer my daily practice revenue grew by more than 30% and we saw our multi-pair sales grow quadruple,” says Dr. Dave Ziegler OD, Ziegler-Leffingwell Eyecare. “I’ve tried many things to drive second pair sales and this has been the best by far. It has created happier patients and has made our staff confident knowing that they’re recommending the best lens to meet patients’ needs. And now the Ultimate Offer is more stylish than ever to attract single vision patients. Single vision patients will continue to get their ultimate in vision with Eyezen™+ lenses, and can now get the ultimate style by pairing them with the new Transitions® Signature® Style Colors and Transitions® XTRActive® Style Mirrors. These trend-setting offerings open the door to a new, fashion-conscious wearer who wants to create a unique, personalized look with their lenses and frames and protect their eyes from harmful light. The Transitions Signature Style Colors will be available as an option for the single vision Ultimate Lens Package with Transitions® Signature® VII. Transitions Style Mirrors and Style Colors will both be available as an option for the second free pair of lenses offered to consumers through the Ultimate Offer.